On the beach a stiff wind. But in the pinewoods – stillness. And its hastening rush journeys around from treetop to treetop before quietening. Again the wind touches the trees, but its voice comes from another direction. In the woods it is difficult to pinpoint its bearing. The sound of dry, cracking wood as its intensity peaks. A wood-pigeon flies past and lands clumsily with flapping wings and a clatter. And again the wind swells. Far away, seagull cry, and traffic rumble. Dog walkers walk wordlessly past. Above, a longer, more sustained gust dies and builds repeatedly. On the ground – stillness. This entry was posted in listening, noticing, writing and tagged movement, sound, wind, woodland on February 3, 2017 by debbielyddon. I have finally finished my two-part work, Aeolian Pipes: 56 Salt Cylinders. This one has caused me a lot of trouble with things not doing what they are supposed to do! 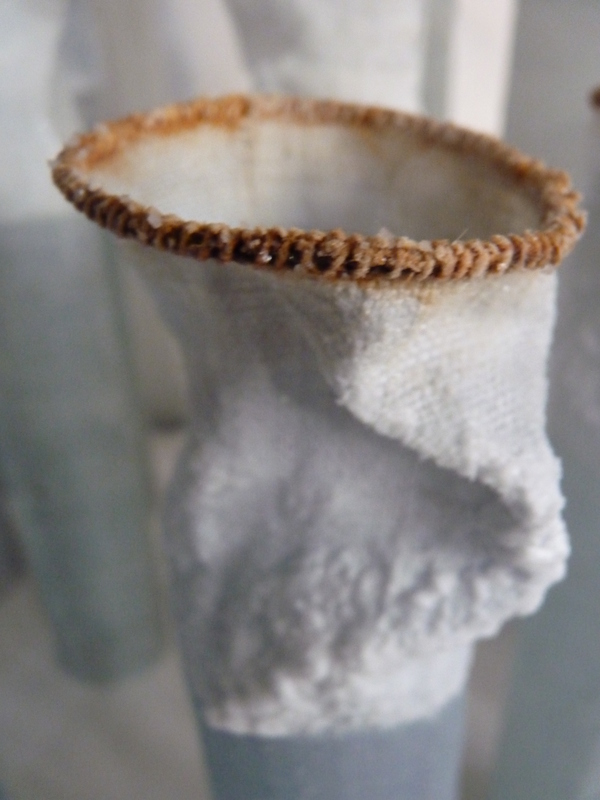 Soaking cloth in saltwater is not an exact art – the rate of evaporation, temperature and the saturation of the saltwater all affect how the salt encrustations manifest themselves on the work. Sometimes it works – sometimes not and this piece has taken several attempts. However I am quite pleased with the finished result. 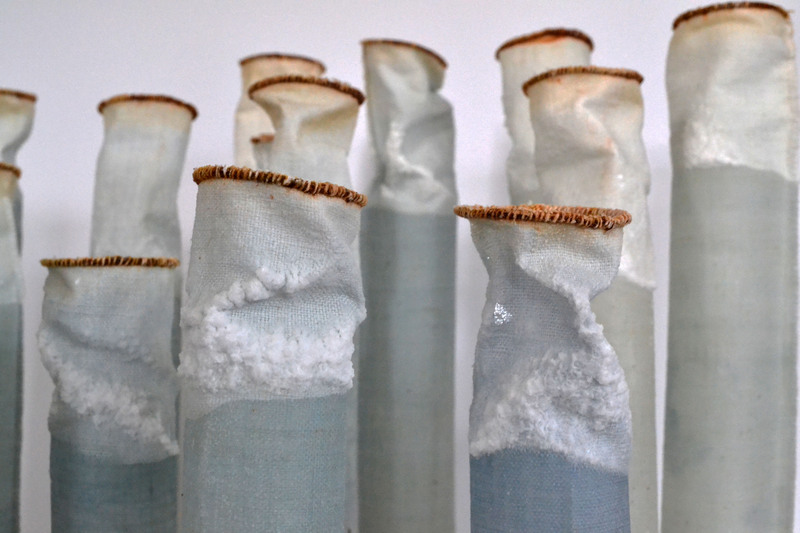 Aeolian Pipes: 56 Salt Cylinders is the culmination of a series of pieces that consider how the sounds of the coast could be visualised. This work is inspired by graphic scores – a method of writing down sound through drawing rather than musical notation and explores the movement and sound of the wind. 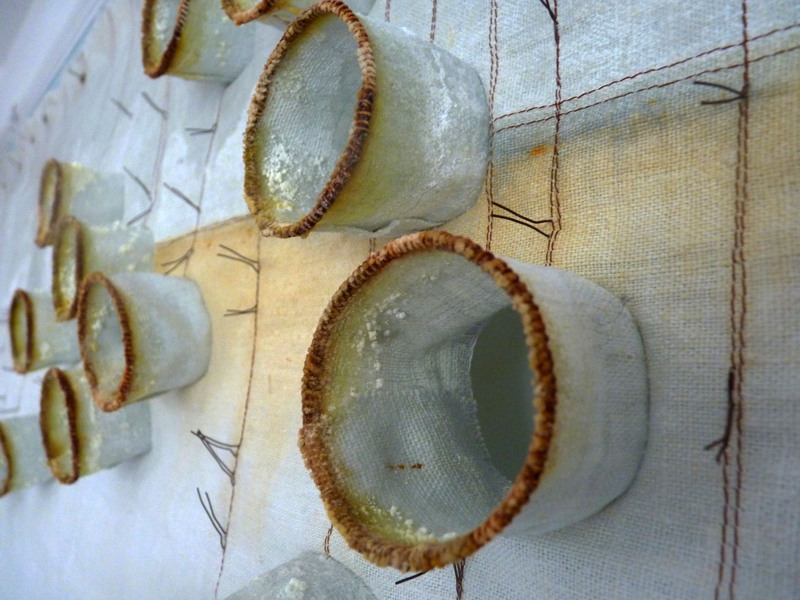 The sculptural tubes and cylinders are poised ready to capture a passing breath and give the possibility of sound. Aeolian Pipes: 56 Salt Cylinders comprises 28 tubes projecting from a wall-hung cloth, mirrored by 28 free-standing cylinders on a plinth below. The cloth is 2m x 70 cm and the cylinders range in size from 4-8cm diameter and 20-50 cm high. 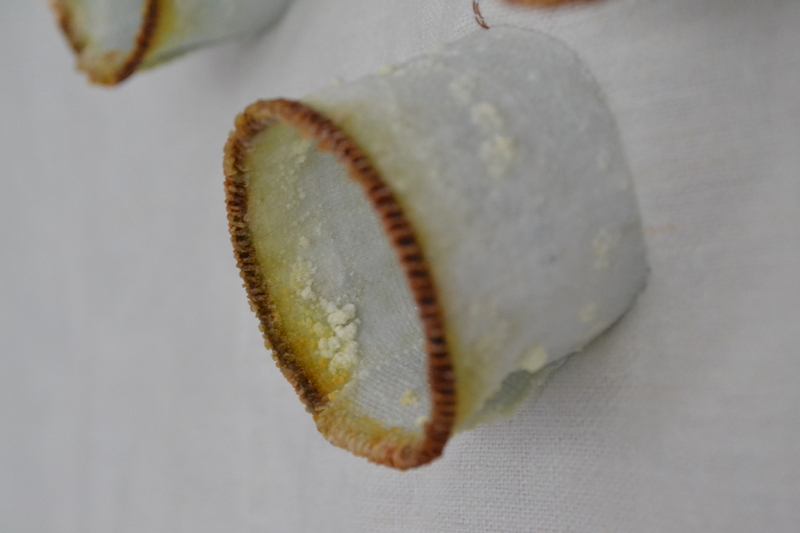 The wall-hung cloth and the cylinders have all been soaked in saltwater and are encrusted with salt crystals. 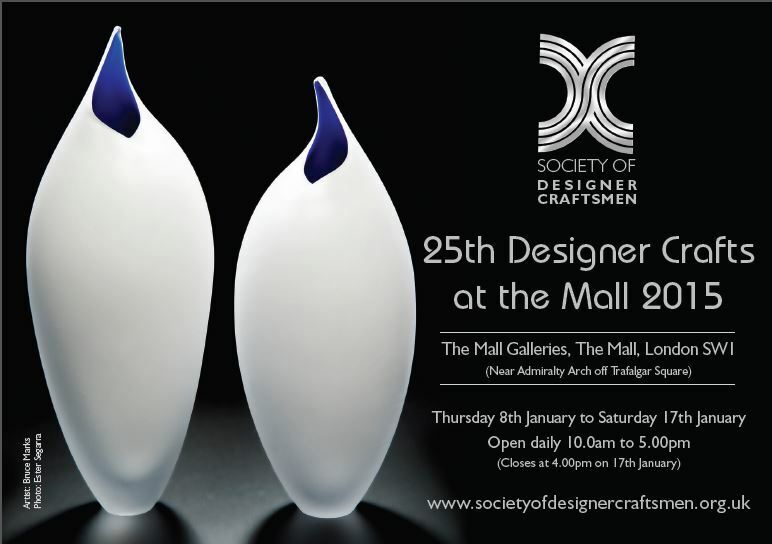 This work is going to be on show at the Society of Designer Craftsmen, 25th Designer Crafts at the Mall, The Mall Galleries, The Mall, London SW1. 8-17 January 2015. 10am – 5pm daily. Please do go along and have a look if you are in the area. This entry was posted in exhibition, listening, making and tagged exhibition, movement, sound, wind on December 14, 2014 by debbielyddon.